Ever since I joined Toastmasters, I don't recall seeing a timing lights device being used either in my present club or in the previous one. If at all, the timers used colored cards or some other items. Of course, it is different when it comes to Toastmasters competitions at the area (or above) levels. You can be sure that signalling lights for timing Toastmasters speeches would be available. Usually, the sponsoring club or one other competing club will be bringing their own timing device for use. When I see these timing lights, I actually become envious. They look professionally made and look so cool. The Toastmasters resources page offered such a device. But alas, the tower-type timing device that looks like a traffic light being offered by Toastmasters International was beyond my budget. Nonetheless, I made it my project to have a timing lights device for our club. Ours is a community club and we didn't have storage space at the venue for our club materials. If we had a timing or signal light for speeches, I didn't mind bringing it along every time. After all, I was Sergeant-at-Arms at that time. How difficult could it be to make one, I thought. I'm not a electrical engineer nor a electronics gadget hobbyist, but I did have basic electricity subjects in high school and college. With piece of paper and pen, I made a rough drawing of a simple wiring schematic diagram of what might work. Over lunch at the office, I showed this circuit diagram to my friends. The 3 lamps mentioned above are the green, yellow (or amber) and red lights. One of my friends, Anthony, is an electronics buff/hobbyist and took interest. He said LED lights would work for this. But would they be bright enough? I somehow imagine LED (light emitting diodes) to be these tiny "ON and OFF" indicator or pilot lights you see in small appliances or transfomers. To me, they're hardly visible or unlikely to get attention from a speaker. At any rate, I asked him to make one for me and promised him my Toastmasters club would reimburse him for all his expenses. After almost a month of dilly-dallying, Anthony brought his finished timing device that I challenged him to do as DIY (do-it-yourself) project. In the photo below, you'll see the three lamps lit in three images. The plastic black box that housed the circuitry measures 8" x 6.25" x 2.75". It was amazingly light that I thought the box was empty. Indeed, he used not one, but two LED lights for each lamp. What I immediately noticed were the ping-pong balls on top of the LED lights. Anthony said they were there to appear as "bulbs". 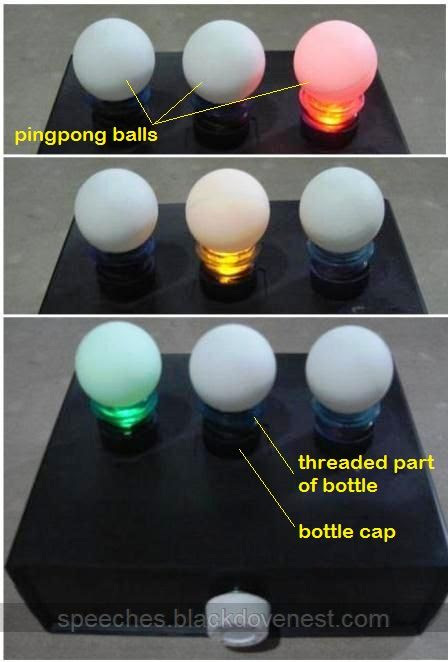 If anything, the ping-pong balls diffused the LED lights. I thought the light effect wasn't bright enough. In a dark room, the ping-pong balls only had a soft pastel color. But we hardly have meetings in a dark room. So, the lights definitely need to be brighter.